‘Queen of Katwe’ is an enjoyable film from Mira Nair, based on the true life story of Ugandan chess champion Phiona Mutesi. It focuses on Phiona’s upbringing in the slum of Katwe in Uganda’s capital city, Kampala, and her discovery of the game chess through meeting local sports coach Robert Katende. When her ability at chess exceeds anyone’s expectations, she starts to envisage a future for her and her family away from the extreme poverty they have grown up in. I enjoyed ‘Queen of Katwe’ to a certain degree; it’s got a heartwarming rags to riches story at its core and its script is funny, cheerful and uplifting without sacrificing showing the hardships of the environment the characters live in. As the coach Robert Katende, David Oyelowo is fantastic, and newcomer Madina Nalwanga gives an impressive performance as Phiona. 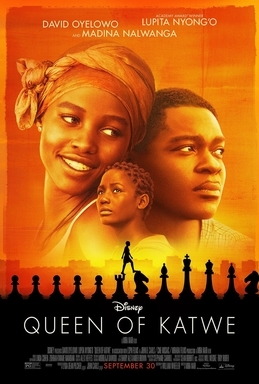 This is a story that’s been done before, and besides the setting, I thought ‘Queen of Katwe’ struggled to move away from the clichés of the genre and it leans far too heavily on chess metaphors to the extent you’re virtually groaning towards the end of the film. Director Mira Nair has a strong resume and she excels at blending the poor backdrop these characters come from with the opportunities off a better life that appear out of reach to most of the children (there’s a great shot with one of the kids as a black silhouette watching people playing cricket on a nice grass field). I felt Nair’s direction fell down with the chess scenes themselves and she struggles to make the actual chess feel all that compelling, certainly to anyone who’s seen a sports movie before. Phiona’s opponents are all portrayed negatively as if the filmmakers didn’t trust that we would like Phiona enough without extra incentive. If you’re looking for an easy going feel good movie, ‘Queen of Katwe’ is likely to fit the bill, but if you’re looking for something that rises above the staples of its genre, there’s better films out there.